Saskatoon, Sask. 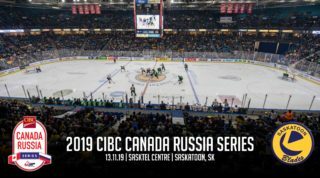 — Wild horses were broken on Saturday night as the Saskatoon Blades defeated the defending WHL champions 8-0 in front of 6637 fans at SaskTel Centre. The win gives the Blades a 2-0 start to the season, the first time Saskatoon has started the opening weekend with two wins since 2011. 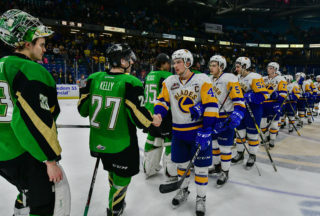 From the opening face-off to the final buzzer it was all Blades beginning with Kirby Dach’s first goal of the night 3:52 into the first period on the first power play opportunity. Max Gerlach continued his goal scoring streak minutes later with his 3rd goal of the season, and 10th goal in his last 6 games dating back to last season. Midway through the frame the Blades were awarded their second man advantage and once again made the Broncos pay. Brad Goethals snapped a shot of the half-wall through traffic to make it 3-0 with his first tally of the season. Seven minutes later Dawson Davidson got in on the fun; another power play goal to put the Blades’ man advantage at 3/3 on the evening. And before the visiting Broncos could retreat to their stable to catch their breath, Kirby Dach scored his 2nd of the night to make it 5-0 for the Blades with 1:02 left in the first period. The Blades eased off the gas pedal slightly in the second period in terms of goal scoring, but a bone-crushing hit from Jackson Caller which was followed by a fight kept the momentum in favour of the Blades. And since Caller was only standing up for himself after what was a clean hit, Quinton Waitzner was given an extra two minutes for instigating, sending the Blades back to the power play. This time around Emil Malysjev found Riley McKay with a long stretch pass to send in the Swan River, Manitoba native to make it 6-0 Saskatoon with his first goal in a Blades uniform. Mckay's first as a Blade comes on the power play and it's 6-0 #BladeCity! In the final frame, the Blades kept coming as Kirby Dach netted his 3rd goal for his first career hat-trick and 5th point of the night. Jackson Caller was the final goal scorer of the night putting the snowman up on the score clock to make it 8-0. Nolan Maier made 17 saves for his 1st shutout of the season while Joel Hoper endured a much tougher night going 31/39. The Blades special teams were dominant going 4/6 on the power play and 2/2 on the penalty kill. Five Blades enjoyed multi-point performances including Kirby Dach (3G, 2A), Eric Florchuk (3A), Max Gerlach (1G,2A), Dawson Davidson (1G,2A), and Emil Malysjev (2A). Kristian Roykas-Marthinsen also earned his first WHL point with an assist. The fun filled night leaves the Blades scattered across the top of the league leaders in points and standings. 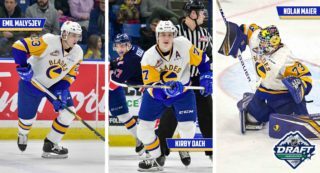 Kirby Dach sits atop the league leaders in points with 7, Nolan Maier leads all goalies with a 0.50GAA and .970SV%, and is the first goalie to post a shutout this season. 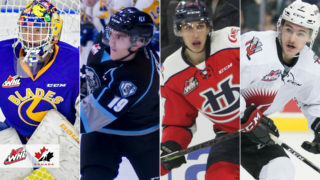 Max Gerlach sits tied with Kirby Dach and two others in the league with three goals, Emil Malysjev leads all rookies with 3 assists, and the Blades are one of six teams to start the WHL opening weekend with a 2-0 record. 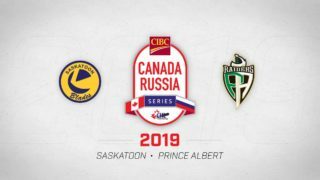 The Blades will now have a full week to rest, recover, and prepare for their next matchup on Saturday when they play host to the Medicine Hat Tigers.